Over 30 militant attacks have been registered since midnight. Two Ukrainian servicemen were killed and six were wounded in combat in the antiterrorist operation (ATO) area in Donbas from midnight to 6 p.m., the ATO HQ has said in its regular evening update. The Russian occupation troops pounded Avdiyivka with heavy weapons, including BM-21 multiple-launch rocket systems, 152-mm and 122-mm artillery and tanks. Following the morning barrage with Grads and artillery, the enemy made several attempts to attack the Ukrainian positions but had to retreat, having suffered losses. In the Mariupol sector, pro-Russian militants attacked Krasnohorivka with a tank, 122-mm artillery, 120-mm and 82-mm mortars, grenade launchers and small arms. Bohdanivka came under fire from 122-mm artillery. Mortars of various calibres were used against Maryinka and Chermalyk. The militants fired with grenade launchers, heavy machine guns and small arms on Shyrokyne, Novotroyitske, Novomykhaylivka and Novohryhorivka. In the Luhansk sector, they used 152-mm artillery against Vrubivka, mortars against Katerynivka and Popasna, and small arms against Krymske. A total of 36 fire attacks by pro-Russian militants have been registered since midday. 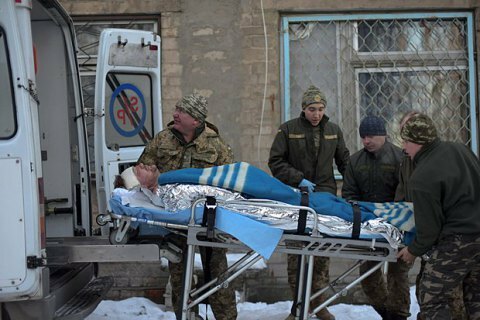 On 31 January, one Ukrainian serviceman was killed and 18 were wounded in Donbas. Since the start of the escalation in violence in Donbas on 29 January, 10 Ukrainian servicemen have been killed: four on 29 January, three on 30 January, one on 31 January and two on 1 February. Gorshenin Institute VP predicts "change of globalization leaders"